Rahul Gandhi pre-empted the BJP government, which may announce its own income support scheme in the budget on February 1. New Delhi: On February 1, when the Modi government presents its last budget before the 2019 election, it is likely to try and make amends to farmers. The BJP has been unable to check the decline in rural incomes and farmers’ distress contributed heavily to its recent defeat in three major state polls. The budget is expected to go beyond loan waivers or raising minimum support prices, to offer an income-support scheme based on direct benefit transfers – perhaps even a Universal Basic Income (UBI). On January 29, however, Congress president Rahul Gandhi pre-empted the ruling party and announced a minimum income guarantee ‘for every poor person to help eradicate poverty and hunger’ if his party comes to power. The promise was made in Raipur, the capital of Chhattisgarh, at a ‘Kisaan Abhaar Sammelan’, just after Gandhi had distributed loan waiver certificates to farmers. It implications go far beyond farmers, however. “We don’t want two Indias. There will be one India, and in that India, the Congress will give minimum income to every poor person,” Gandhi said. “No government in the world has done this till now. The Congress is going to do that. It will be a historic feat.” He did not provide any other details about what the scheme, or legislation, would entail. It is clear however that the minimum income guarantee (MIG) is not the same as a Universal Basic Income (UBI). The UBI is an idea first developed by Thomas Paine in 1796, when he advocated that every person over the age of 21 be compensated for the loss of her natural inheritance due to introduction of the system of landed property. In the present era, the idea has evolved into the form of an unconditional, universal cash transfer, as a means of dealing with poverty, growing inequality and the loss of livelihoods due to automation and changing technology. Crucially, the UBI involves a form of income transfer to every person within a territory. The Congress’s proposal, in contrast, would be for ‘every poor person’ and not every person. “I promise you that we can find the money to do this and remain within 3% fiscal deficit,” Chidambaram told CNBC TV18. In May 2018, Telangana became the first state to implement an income support scheme, the Rythu Bandhu. Other states like Orissa and Jharkhand have since followed suit. However, Chidambaram denied that the scheme will be based on the Rythu Bandhu, which provides Rs 8,000 per acre to farmers over two crop seasons. The scheme has been criticised by economists, including former chief economic adviser Arvind Subramaniam, for being regressive – that is, making proportionally larger transfers to farmers who own more land. The Congress’s announcement came a day after Subramaniam and his colleagues published an article in the Business Standard advocating for direct cash transfers to rural households to deal with the agrarian distress. The quasi-universal basic rural income (QUBRI), as the authors called their proposal, would benefit all rural households except ‘the demonstrably well-off’, who will be excluded based on the Socio-Economic Caste Census (SECC). The Congress’s proposal goes beyond even Subramaniam’s QUBRI, by including not just rural, but also urban households who are categorised as ‘poor’. If the idea is to bring everyone up to the poverty line, Kumar says, then the cost of the scheme could be one-fifth of the cost of a UBI (assuming 20% of the population is below the poverty line). 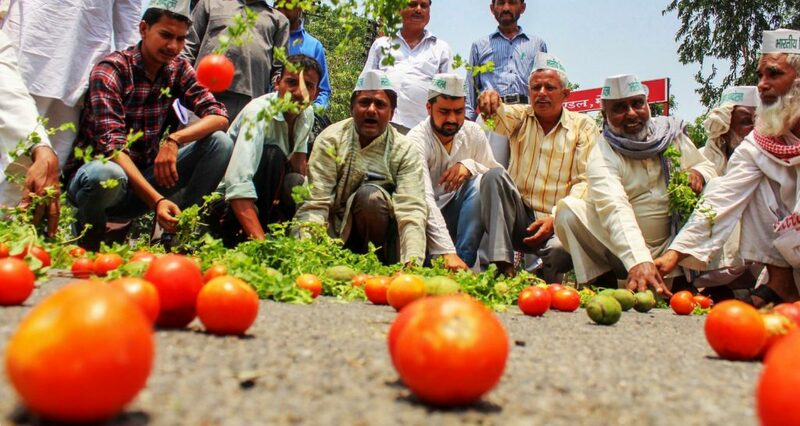 The Congress party’s announcement cements a paradigm shift in economic policy aimed at agrarian distress. Most farmers in India are dependent on the monsoon and a bad monsoon means low productivity and low incomes. In recent years, however, a good monsoon has meant increased productivity – leading to oversupply and a crash in prices. As a result, rural incomes have been consistently stressed. A recent Reserve Bank of India paper showed a declining trend in rural wage growth since 2014. Farmers have found themselves in cyclical debt – pushed to borrow, but unable to repay. According to NABARD’s Financial Inclusion Survey 2016-17, the average outstanding debt of a rural household was Rs 91,407. The policy response so far has been two-fold – increasing minimum support prices (MSP) for crops, and waiving farmers’ loans. The MSP mechanism, as we have pointed out earlier, is limited in its scope and capacity to deal with the problem of declining incomes. According to the National Sample Survey Office (NSSO) in the 70th round, only 6% farmers are able to sell their produce at MSP. Only 24% of households, at best, are aware of the MSP of crops they grow, according to a 2017 study. Loan-waivers too are not designed to solve the problem of low incomes. They offer temporary relief, and clear the slate for systemic reforms.